I’m writing this on the UK’s hottest day of the year. There is a light breeze, but everyone I have seen today has beads of sweat on their forehead. Seeing someone wiping their brow is a fairly common sight in midsummer, but it reveals a simple and fascinating truth about our species: without sweat, we would not still be here. Without this absolutely amazing technology we would not have climbed our way to the top of the evolutionary pile. Many animals perspire, but no others use it as such an efficient and refined cooling technology. So how does it work and why do we owe it so much? As a species, over short distances, we are hopeless runners. We might be able to go a long way but what use is that if we can’t catch anything? The truth is that we never could if it weren’t for several factors that make us identifiably human. And it is our ability to perspire which renders them all effective. So we may have perfect bodies for distance running, but those features that enable us to move so effectively are useless without correct temperature control. There are distinct thermoregulatory advantages to being a two-legged human. Being merely upright, for example, means that less of the sun hits you when it’s at its hottest. The bipedal human exposes only about 7% of their surface area to sunlight; it is triple this for a quadruped. This fact alone means that being on two legs enables you to move with greater heat efficiency. Also, by being upright, we can take advantage of the fact that our brains are further away from the harsher micro-climate at ground level. It is hotter there because it is heated by the sun and because there is less air movement. And with air movement comes evaporation, which is the real miracle technology. Evaporation is such an effective way to lose heat that if a litre of sweat is able to evaporate on the surface of your skin, you can lose about half a million calories of heat in the process. While most quadrupeds sweat, they do so to maintain skin health and create scent (we do this, too), and even to create ear wax (which, amazingly, is a sort of sweat). But for thermoregulation, most animals use interior air movement (panting) to cool down – where their bodies have to actively work to lose heat. So that means, on a hot day, we could chase down a quadruped, and when it stopped to shed some heat, we humans could keep going and close the gap a little. Eventually, the distance between predator and prey would close as their technology failed, and ours kept functioning. Sweat meant that we were much better hunters than we appeared. It is decidedly odd that sweat is taboo in our society. Do it in the wrong place or from the wrong part of your body and the people around you will become uncomfortable, or at the very least make you feel so … and that will probably make you sweat. Sweat in a gym and it’s aesthetic: it’s a badge of honour. It’s part of the training montage of any sports movie you might think of. But get it wrong – sweat in a job interview, a presentation, or in a social situation – and people will think you’ve lost control, or that it’s a stress response because you are deceiving them. But without it we would never have become who we are, have survived to the point when we could invent things, create art, make music, or surf the net. 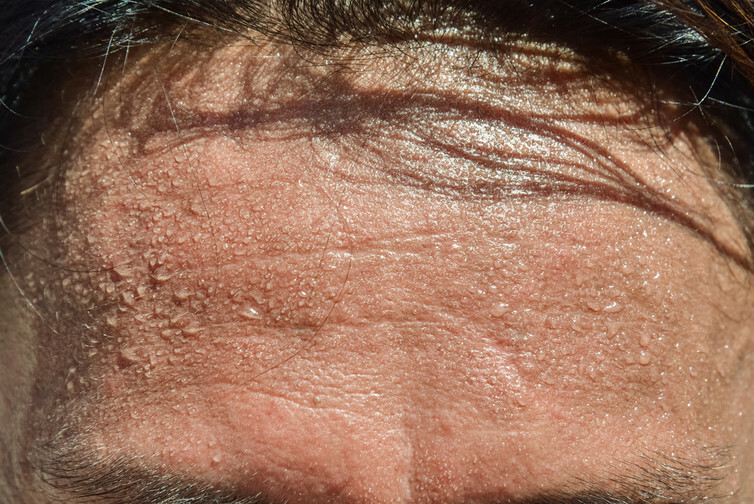 So as you struggle through the next few days of hot weather, think of those beads of sweat on your forehead, and the fact that the exposed skin there, and its ability to perspire, is what keeps your brain functioning in the heat. In the past, it made you a lethal weapon out on the savanna, now it might allow you to reflect on what it has allowed you to achieve in the past, and that without those 2.5m sweat glands on your skin working to maintain the correct temperature for thought, you would not be here, reading this.